The so called “cotton campaign” is starting at the beginning of September in Uzbekistan, when farmers are not the only ones to go the fields, but also government workers, students and school children. Even if, year after year, the authorities promise that the former will not be doing involuntary free labour, the fate of the state sponsored students or even private company employees, who have had orders from “above”, has been decided. The practice of using city dwellers in agricultural work has been around since Soviet times, but it is difficult to assign it as “the tragic inheritance of homo Sovieticus”. More likely, this practice is reminiscent of a slave-owning system. Maxim Baileys, Fergana’s Tashkent observer, has written a review of this situation. This year, the authorities of Uzbekistan are taking unprecedented measures to mobilise a free labour force to pick the cotton harvest. The season begins at the start of September and goes on until late autumn. Town and city dwellers are torn away from their jobs and homes, and are forcibly sent to agricultural locations. A large part of the country’s residents essentially becomes slaves during the cotton picking campaign. This is despite the fact that Uzbekistan is a country with a high level of unemployment, and millions of the country’s citizens work abroad out of sheer necessity. The reason for the lack of workers in the cotton fields is the low purchasing price of cotton grown at private farms, which is set by the government. Despite the farming enterprises being organised on the basis of partial ownership of production and land leases, each farm is prescribed a compulsory plan to surrender its cotton to the government. Not fulfilling the set plan leads to serious consequences, including physical punishment and imprisonment. Quite a number of farmers who have not fulfilled the government plan to surrender cotton have been known to commit suicide. Almost all the cotton in Uzbekistan is picked by hand, without the use of cotton picking machines, which the country had previously produced in large numbers. There are two main reasons for this: firstly, industrial machine building has been almost completely destroyed in Uzbekistan, secondly the cost of diesel fuel is high and slave labour is almost free. The sale of cotton is one of the main sources of income for Uzbekistan’s corrupt elite. Farmers do not have the right to independently sell the harvest that they have grown themselves; they surrender it to be processed by enterprises controlled by the government, and then this cotton is resold at world prices for foreign currency in the external market through foreign trade associations, which are part of the system of the Ministry for Foreign Economic Relations (MFER). Of course, if the artificial chain of middlemen imposed by the Uzbek authorities was gone, so would the need for slave labour. The system of forcing people to pick cotton is quite simple. The authorities give industrial enterprises and government bodies the instruction to send a certain number of people to the fields. As a rule, the instructions are given at meetings arranged by regional hokkims (heads of administration), to which managers of large companies and government bodies are “invited”. The managers, having received “an offer they can’t refuse” are then forced to pressure their own staff to make their employees go to pick cotton. Since last year, the authorities began widening the circle of companies and organisations, even including those in Tashkent, which are forced to send their staff to the fields. Since people are not used to defending their rights, they do not know how to stand up to the authorities and are afraid of losing their jobs, so they follow the illegal orders. This year, the authorities have sent the police and even the special forces to mobilise people to pick cotton. Before the cotton season began, regional hokkims demanded that lists of names of those who will be sent to the fields, along with their passport numbers and home addresses, are provided by the managers of the companies and institutions. The mass cotton picking drive will begin on the first day of autumn – the third of September, straight after Uzbekistan celebrates its Independence Day. The slaves from Tashkent will be sent to the Sirdaryp and Jizzax provinces. The place of the mass departure is Tashkent’s South rail station. Regional hokkims have warned that registers will be taken before departure, and police will go to the homes of those who have not turned up. It is also possible that people sent to the cotton fields will have their passports taken away for the duration of the campaign. This year magistrates, doctors, teachers from pre-schools, schools, colleges and higher education establishments, and employees of government institutions will be sent to pick cotton. The staff of large industrial companies, public or private, will also undoubtedly be sent to participate. Sometimes the current situation in Uzbekistan is likened to the Soviet period, when city populations, including students, were sent to pick cotton. Urban residents were sent to the fields due to the inefficiency of the planned economy and the command administration system. It would seem that the market economy, lauded by President Islam Karimov, must change the situation. However, the head of Uzbekistan, a graduate of the Soviet party system, continues to rule the country in the Soviet spirit. Cotton collection in Uzbekistan is forced labour, which takes place under the threat of the labourer losing their main job, and under the watchful eye of the police, and now – even under the machine gun barrels of the special forces. The involvement of security forces in sending town residents to the fields is not inspired by the authorities’ fear of protest – it is a demonstration of the ruling elite’s arrogance and feeling of absolute impunity. It must be said, that many companies buying Uzbek cotton do not know anything about this or, they do not want to know. 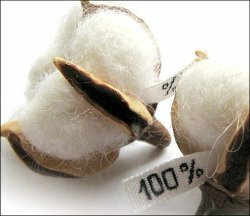 Cotton picked by the hands of slaves, is the same cotton – it is not distinguished by colour, smell or the length of its fibres. Suffering does not leave its marks on material objects. As for the slaves – the slaves are mute.